YogaHands™, the first of its kind hand stretchers that help relieve pain naturally are available at YogaPro.com. 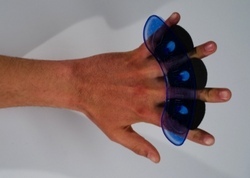 This simple but highly innovative device is designed to stretch, condition and refresh hands. It helps with treatment for conditions like Carpal Tunnel Syndrome and Tendonitis. YogaHands™ will be available online at YogaPro.com and at select retailers starting March 9th, 2011. This week, the Michigan company that brought its revolutionary toe therapy device YogaToes to the market is launching a new hand care product –YogaHands™. The unique hand stretchers will be available on YogaPro.com and at select retailers. Hands are constantly in use, whether typing at a computer, texting, or operating equipment; and they need relief. Using the same know-how that made YogaToes a global success, inventor Frederic Ferri has developed a hand therapy device that refreshes overworked hands almost instantly. Yoga Hands passively stretch hands and release tension. “We forget that repeated motions like typing and using a mouse can cause injury. These movements seem too small to matter, but they do,” said Frederic Ferri, founder of YogaPro. “YogaHands relax hands and help undo the effects of the modern workplace. They're really the first of their kind”. Mr. Ferri sees YogaHands as an integral addition to his successful line of Yoga-based preventative health care products. “The hands are arguably the most used and abused parts of our body. But, most hand problems are addressed after the fact by intervention. Natural therapeutic design-based devices that maintain optimum performance are still in the early stages of development ”, stated Mr. Frederic Ferri. “We are creating new generations of personal health and wellness products that strengthen overworked body parts and in turn, help people avoid pain, disability and costly surgeries”. The first users of Yoga Hands have had positive experiences. Jason Tait, a financial planner, said: “After using YogaHands I noticed increased flexibility in my fingers. At first use I couldn't t get the device on all the way, but now I can and my joints feel loose”. In an era where Carpal Tunnel Syndrome and early onset arthritis are increasingly prevalent, Yoga Hands™ provide quick and simple therapeutic support. Easily affordable, anyone can test the effectiveness of the YogaHands hand stretchers. Starting March 9th, they will be available online at http://www.yogapro.com as well as in select retailers.